As one of the Baltics leading business school, RBS combines professionalism, dedication and expertise to develop and ecourage our students and graduates to become responsible and thoughtful leaders and entrepreneurs who create sustainable prosperity in the Baltic region. This year, RBS celebrates 25 years as a pioneer of international business education in Latvia. 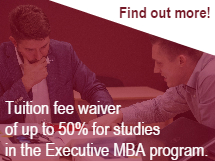 Adding to our network of more than 1000 succesfull graduates, strong and collaborative team of administration, highly respected and knowledgable faculty, innovative and technically advanced study process, solid international relationships and multicultural environment – this is priority of Riga Business School community.